The default Android lock screen can look boring and dull. However, you do not have to settle for the system default lock screen app. You can try some of these Android lock screen customization apps to make your smartphone or table look unique. Here are the best lock screen apps to replace the default Android lock screen. CM Locker doubles as a smart lock app. You may use it password protect other apps on your android phone. Other cook features include HD wallpapers, notification support, a news feed and the ability to take a photo of anyone trying to bypass your security settings. However, the app does come with adverts. This makes up for the fact that there are no in-app purchases. Download on Google Play. AcDisplay offers a minimal design for your lock screen. The background is dark which helps extend your Android’s battery life. On the screen, you see notifications that appear when you pick up your phone. Furthermore, you can choose which app notifications appear on your lock screen. See more features and download on Google Play. If you have a little battery life to spare, then the Next Lock Screen app brings the best lock screen wallpaper via Bing. Get quick access to wifi, Bluetooth and screen brightness from the lock screen. 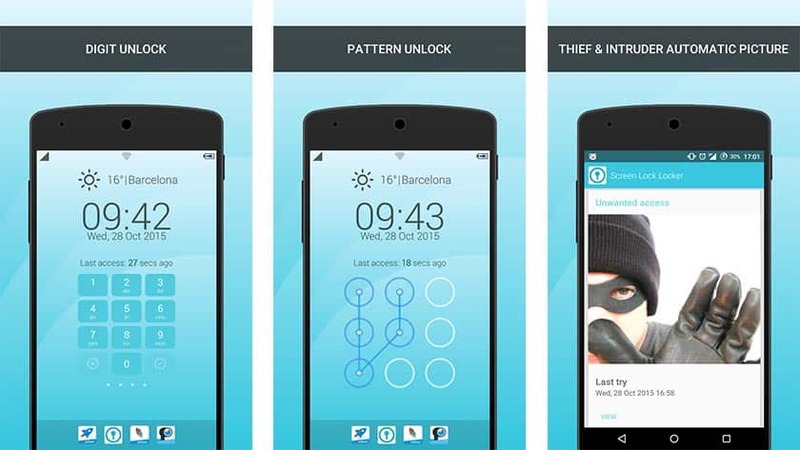 This cool lock screen app allows you to lock your phone based on location and time. Also, view your favorite apps and contacts on the screen without unlocking your phone. Lastly, you can still get your favorite notifications on the lock screen. For more features and download find it at https://play.google.com/store/apps/details?id=com.microsoft.next. Alarm Anti Theft Screen Lock integrates security features along with a unique lock screen on your Android device. Once enabled, those who do not know your lock screen password, risk setting off an alarm after too many incorrect tries. The interface is not the usual bells and whistle, but it does add an extra layer of security. See more information on the Google Play page. Hi, how are you? I hope you are doing well. Now, how about trying out Hi Locker? Choose from a variety of lock screen styles to customize your Android’s interface. Hi Locker supports fingerprint security as well as a smart lock feature. The smart lock lets you unlock your phone once you are on a trusted network or near a trusted device. There are also cool lock screen wallpapers from which you can choose to set as the default. Hi Locker is on the Play Store for download. Semper is lightweight, simple, and effective. However, security-wise, it’s not the best. What Semper does is help you improve your knowledge by using trivia questions to unlock your smartphone. But, you can also bypass the questions, if you do not know the answer, and go straight for the lock-screen. Get it here. Another good lock screen replacement app is Echo Notification Lockscreen. This lock screen application puts emphasis on notifications. Echo has a minimal and lightweight design that provides notifications, smart alerts, and security settings. Find out more about the application at h[Alternative Dowloads]. Perhaps the most popular on the list, the Go Locker lock screen replacement app allows you to customize the lock screen with themes. Also, you can read messages directly from the lock screen and gain access to system switches and settings. It has over 100 million downloads so there must be something good about it, right? Moreover, there are loads of other customization options from which to choose. Another unique lock screen app to try is Picturesque. This app is a Microsoft-developed app. So, you might see similarities between Picturesque and Next. Just like Next, Picturesque changes your wallpaper to the Bing image of the day. There are app shortcuts, the option to perform quick searches, see the weather and more from the lock screen. Find it on the Play Store. Do you miss the old KitKat or Jellybean lock screen? Try Holo Locker to get the stock Android lock screen from both those builds. It is a straightforward and fast lock screen replacement solution. However, there is nothing fancy abut the app. Get it on Google Play. LokLok Connected Lock Screen stands out in that you can send messages to anyone right on your phone’s lock screen. ZUI Locker allows for complete customization on your Android device’s lock screen. Use the Zui control panel to access shortcuts, system toggles, and RAM/Memory usage. Moreover, you can set custom wallpapers, layouts, and styles. And, for added security, ZUI locker captures a selfie of anyone trying to unlock your phone without the password. Get it from https://play.google.com/store/apps/details?id=com.zuimeia.suite.lockscreen.international. If added security is a must, then Screen Lock Guardian covers the safety aspect of your lock screen. It replaces the default Android lock screen and protects your photos and apps from unwanted eyes. Also, there is the silent selfie feature which snaps a photo of anyone who enters the incorrect password too many times. Find it on the Play Store. Start Lock Screen claims to be the best Lock Screen replacement app . However, that depends on the end user. It offers quick access to your favorite apps, contacts & media without having to unlock your phone. Furthermore, you can get apps, weather notifications, news updates and social media alert from the lock screen as well. See all the features on the Play Store. Lastly, I present another good lock screen app, Gesture Lock Screen. With this lock screen replacement, you can unlock your Android smartphone with a gesture. Furthermore, it offers the same features as most other apps on the list. However, the free version has ads and may prompt you to install unwanted apps. These applications still allow you to use your pin code/password. Likewise, if your smartphone supports fingerprint unlock or slide to unlock, you may use that as well. Some even offer the option to customize your home screen. Thanks for reading Top Lock Screen Apps | Lock Screen Replacement Apps for Android on ORDUH. How about the best Siri alternatives for Android? Do you like following the latest news? These are the top news apps.